In our previous post, we talked about how we implemented one of the major mechanics of Super Hyperactive Ninja: Hyperactive Mode. Now it’s time to discuss another key feature of the game, the use of items. Items were planned for the original Hyperactive Ninja at one point. Because of the “single input” nature of the game, they would act like temporary powerups that let you cross fire, open doors, etc. I still have a notebook full of ideas for more complicated puzzles involving this kind of items. They were against the direct approach we wanted to have with Hyperactive Ninja, so they were left out. With Super Hyperactive Ninja, we thought that we could spice up the game a little by introducing challenges that the player should face by combining hand-eye ability with the use of a specific item. In pop culture, ninjas use a lot of strange gadgets and have power over the elements. In fact, actual ninjas were no more than skilled mercenaries and spies, but that’s no fun. Obviously, we are going for the “pop culture” aspect of the Ninja. Ninjas are often associated with legendary abilities like climbing vertical walls, walking on water, even becoming invisible. Also, anime and manga like Naruto popularized the “supernatural Ninja”, capable of spitting fire, making “shadow clones” and all that. That’s the kind of Ninja we wanted to portray, as it gives us more liberty to do crazy (and funny) things. The problem now was deciding which of those abilities went into the game. We had to choose items that had good synergy with the basic gameplay (that is: running and jumping). A thing that mixes well with that is having a way to inflict damage on enemies. We already had one, Hyperactive Mode, but the game is designed so it doesn’t work against every enemy or every situation. Being a Ninja, an obvious one is throwing shuriken (the classic “throwing star”). We tested that one, and it was too overpowered. In SHN, as in the original Hyperactive Ninja, most enemies are quite dumb and also die in one hit; having the ability to one-shot enemies from far made the game too easy (even if Shurikens were limited). So we changed it to a more risky one: a Katana. On top of that, a single use Katana. To use it, you have to approach the enemy, getting in its area of sight. Also, if you fail, you lose your sword and get exposed to the attack of the enemy. In the other hand, if you hit, you dispatch an enemy quickly and easily. Katanas are also very iconic for ninjas (although maybe not as much as shuriken or kunai), so that was a no-brainer. After testing this one, we were pleased with the result. More ideas related with the use of the Katana came out naturally, as using it to avoid some enemy attacks or to break obstacles in your way. How can a person walk on water? 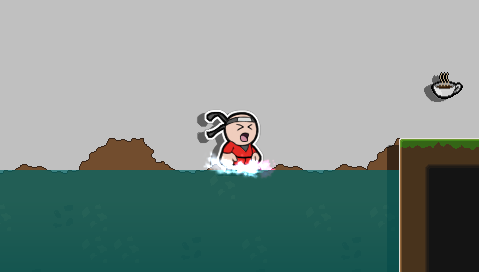 One of the most common abilities displayed by ninjas in movies and other media is walking on water. 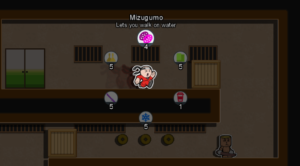 There is proof actual ninja used floats named “mizugumo” (water spider) that were used to cross water. Having that in our game could be of use to make natural barriers that can be overcome at one point. Next one in the “widespread abilities of ninja in mainstream media” was “becoming invisible”. Usually, in ninja movies this is achieved by the use of a “ninja cloak” that magically mimics the environment perfectly. We tried to play this comically by making the camouflage obvious. Also, this was reminiscent of the camouflage mechanic in the previous game Javi and I worked on, so we though it was a nice auto-reference. 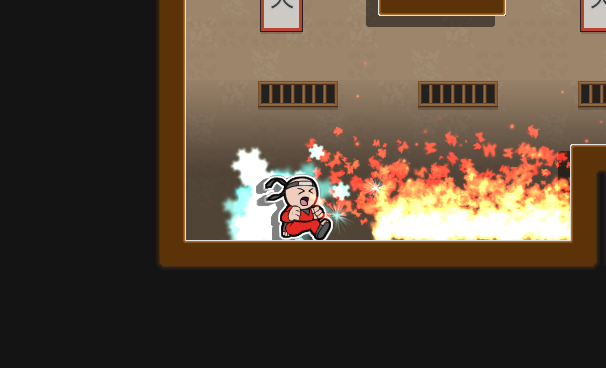 Movement in Super Hyperactive Ninja is mostly horizontal, but you can perform a series of wall-jumps to ascend. Anyway, to do a wall jump you need to be in Hyperactive Mode, and to ascend you need to be between two walls so you can jump from one to the other. We wanted an alternative, and one that didn’t require to have two walls. In fiction (and I suppose in the real world), ninjas use a variety of climbing tools like hooks and ropes. There are even some that use claws and special gloves, but again, we wanted to play it comically. That’s why our ninja climbs walls using two plungers. Before, I said that we planned an item for the original Hyperactive Ninja that let you cross fire. We wanted to rescue that idea. If you are not familiar with Japanese mythology, know that there is a yokai (Japanese spirits, or monsters) called yuki-onna. According to the Japanese folklore, the yuki-onna has ice powers (her breath can freeze things). So that’s the last item, “Yuki-onna breath“. Aside from freezing enemies (and other things), you can use it to extinguish fire. This way, we can set up more “natural barriers” as we did with the mizugumo. 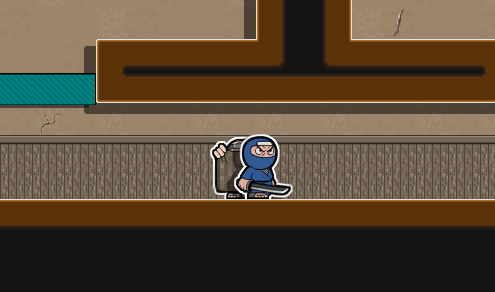 So, more or less, that’s how we came with the items that the player can use in Super Hyperactive Ninja. What do you think? You can tell us in our Discord channel.